Hot Springs Log Cabins - Private, Romantic, Secluded - We have five honeymoon cabins for couples spread out over 11 acres. Each cabin features brand new stainless/granite kitchens, bath vessel sink, fireplaces, HDTV flat screens, and brand new hot tubs on the porch. Some honeymoon cabins are pet friendly too! 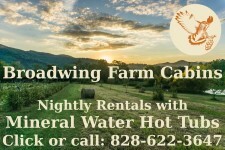 Please see our website at www.hotspringslogcabins.com for more info, availability, and reservations.